very much to my credit, i believe, i own a push mower, one of those devices with rotating blades and a grass box that requires human intervention to push across the lawn in order to make the grass shorter. there are at least a couple of reasons for this apparent manifestation of ludditeness: for starters, given the postage-stamp size of my front lawn, there's no need for a petrol mower and the ever-present notion that i might cut through a flymo electric cable, makes me fearful of using an electric mower. aside from which, putting a bit of effort into the task of cutting grass, need surely not be accompanied by irritating noise? however, come the summer month(s), mrs washingmachinepost is ever keen to have her young charges play outside, gulping in mouthfuls of fresh air as they destroy the bush in the middle of the garden. apparently this outdoor play should not include having to jump higher than the grass in order to find their young playmates. less than convinced of my skills (or timing) for grass-cutting, mrs post engaged the services of a local grass-cutter, thus denying me the fun (seriously) of pushing the yellow peril exactingly close to the fence. that, however, was last year, since when, the employed grass-cutter has departed for mainland pastures, opening the way for a resurgence in the art of hand-mowing. currently, i have resisted discussing the impasse, for if truth be told, the grass has not grown sufficiently to warrant taking even a pair of scissors to it. i am assuming, however, that this may not be the case in the country's more southerly climes. you may reasonably ask quite how i have arrived at this conclusion, to which i would point my esteemed reader in the general direction of the delectable cycling kit, recently arrived from rouleur towers. 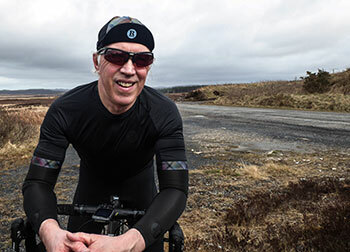 though the nice people in the service of ian cleverly had the forethought to accompany shorts and jersey with both armwarmers and leg warmers, i'd be fibbing if i gave the impression that the constitution of the former was anything other than diaphanous. as the velo club peloton wavers between thermal bibs and thermal tights, the rouleur bibshorts bear no distinguishable signs of thermality. similarly, the short-sleeve jersey; let's just say that had armwarmers not been supplied, they would have had need of being invented. not only that, but the torso is perilously, race-fit short, lessening any nook or cranny in which the odd thermal might be concealed. i must therefore point out, before i begin, that at all times, my upper-body was shielded with either a windjacket (sadly, found wanting) or a thermal jacket (far more amenable, in my opinion). however, it would be hard to deny the skintight comfort afforded by both jersey and bibshorts, but there was an intriguing delight in noticing that the bib straps feature the word 'rouleur', subtly embossed upon their person. the only place i think others would view this artistic bonus, would be in the roubaix showers. and while we're discussing unexpected delights, aside from the usual three rear jersey pockets and the necessary fourth zipped security instance, the rouleur jersey fields a fifth, sneaking round the leftmost corner. 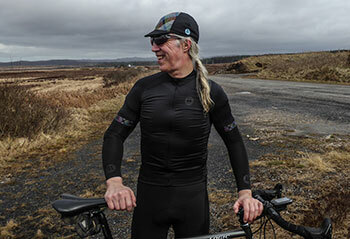 it may well be the first cycle jersey to assist the owner in adhering to velominati rule#29. the sleeves are hemmed with a subtle colour border which i took to be an approximation of tartan, but i believe is based on the colours employed in the iconic mapei jersey. the collar equates well with the jersey's springtime/summer aspirations, given its restricted height, but a full-length zip is the very embodiment of the professional milieu. 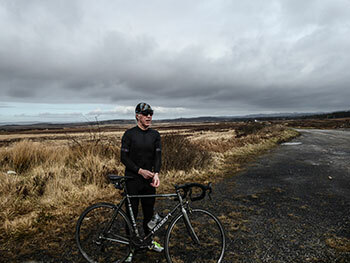 over the thousands of kilometres ridden (i may have slightly exaggerated that part), the bibshorts, comfortingly hard to put on, moved like a second skin, while the grey and red pad provided the comfort that a modern team kit ought truly to provide. were i to have divested myself of thermal/windproof garmentage, you would have considered me of greater importance than that of a mere domestique. the rouleur logo'd armwarmers, if i'm totally honest, were just a smidgeon on the short side, but i do have slightly longer arms than the average domestique. perhaps i have need of moving to the larger size, despite the jersey sized at medium? the grippers at the top maintained the essence of rule#82 ("under no circumstances is there to be any exposed skin between the hems of your kit and the hems of your arm warmers"). given my relative shortness of leg, the legwarmers (which reach all the way to the ankles) were just ginger peachy, though a tad too tight at the ankle to place the socks anywhere but on the outside. that said, the latter do bear a large swath of that rather attractive mapei tartan and should therefore probably be worn that way in perpetuity. the same pattern appears on the front of the matching casquette. 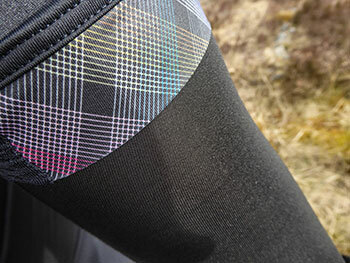 there is also a matching, tartan'd, sleeveless baselayer, but it was unavailable at the time of the review. for those who subscribe to arguably the finest cycling publication on the bookshelf, the opportunity to demonstrate such literary connoiseurship while in the saddle is one to be welcomed with open musettes. and as if this in itself were insufficient to pique your interest, the economical pricing might just swing it. i eagerly await june when the hebrides will have a sneak preview of summer. 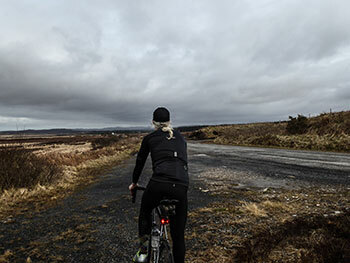 the rouleur cycling kit features a short-sleeve jersey, available in sizes small to xl at a price of £100, bibshorts in the same sizes at a cost of £135 and a similarly sized sleeveless baselayer priced at £40. 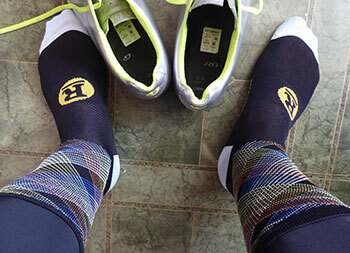 the socks can be had in two sizes, either in black or white at £15 per pair. the cap costs the same. armwarmers are priced at £25 and legwarmers add another £10.